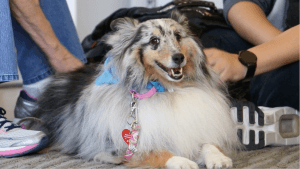 A tsunami of tranquility passed over the Hunt Institute during the therapy dog visit on Wednesday. 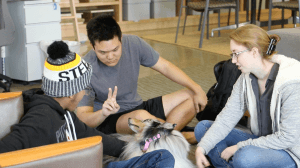 Four dogs and their handlers from Heart of Texas Therapy Dogs spent the afternoon bringing a much-needed calm to SMU students taking midterms. 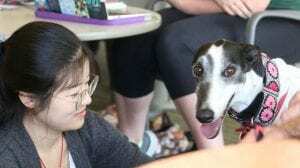 In one corner, a former racing greyhound with a pink leash enjoyed meeting students in one of her first official visits as a therapy dog. 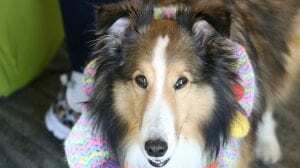 By one couch, a seven-year-old sheltie eagerly showed off her ability to sit, shake and roll over. Her handler had made her a crochet collar decorated with colorful Easter eggs to celebrate spring. Close to the door, an old red golden retriever rested on his side and listened to his handler chat with college students. SMU students filtered in and out of the HI’s doors and stayed anywhere from five minutes to two hours. Almost every interaction began the same way: an apprehensive student would sit down next to a dog and the handler would introduce him. Within seconds, the uncertainty would melt into conversation. Everyone left feeling a little less stressed and more prepared to take on midterms.